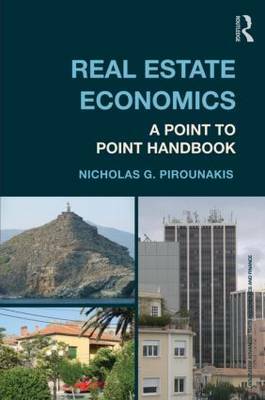 Real Estate Economics: A point-to-point handbook introduces the main tools and concepts of real estate (RE) economics. It covers areas such as the relation between RE and the macro-economy, RE finance, investment appraisal, taxation, demand and supply, development, market dynamics and price bubbles, and price estimation. It balances housing economics with commercial property economics, and pays particular attention to the issue of property dynamics and bubbles - something very topical in the aftermath of the US house-price collapse that precipitated the global crisis of 2008. * contribute positively to the preparation of economic analyses of RE assets and markets soon after joining any company or other organization involved in RE investing, appraisal, management, policy, or research. This book should be particularly useful to third-year students of economics who may take up RE or urban economics as an optional course, to postgraduate economics students who want to specialize in RE economics, to graduates in management, business administration, civil engineering, planning, and law who are interested in RE, as well as to RE practitioners and to students reading for RE-related professional qualifications.